Whether logging miles in the car or stuck on a cross-country flight, we’ve found that a good podcast can really help the time fly by. We’ve compiled our list of go-to podcasts that are entertaining, inspiring, AND educational. Happy listening! What You’ll Hear: A weekly interview series featuring a mix of entrepreneurs, holistic MDs, and thought leaders sharing tips to get ahead and feel your best. 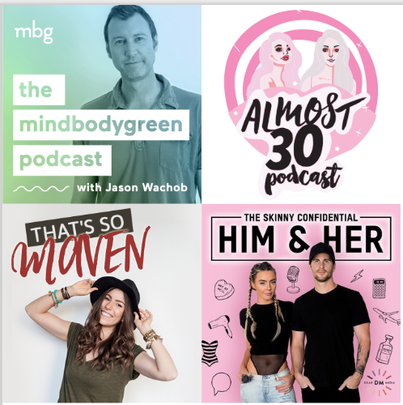 Why We Love It: We love the curation of guests on this podcast - so many of the influencers we follow and the brands we love! Plus, Jason's voice is super soothing and always puts us in a good mood. What You’ll Hear: One of our favorite SF-based bloggers, Davida from The Healthy Maven, covers everything from mindfulness and meditation to what its like working in the wellness industry. Why We Love It: We love the realness of Davida and her guests. She goes DEEP and asks her guests about the advice they'd give their 20-year-old self. What You’ll Hear: Co-hosts Elizabeth and Stephanie bring a refreshing and relatable approach to wellness as they chat with bloggers, brands, nutritionists, doctors, and more. Why We Love It: As almost 30-somethings ourselves, we love how relatable the co-hosts are. They’re able to cut through the fluff and ask about the stuff that's on our minds, too. Their advice is realistic and practical for a 30-something woman. What It Is: Lauryn, the lifestyle blogger behind The Skinny Confidential, teams up with her husband and fellow entrepreneur for a mix of interviews and solo episodes packed with tips and tricks. Why We Love It: Lauryn and Michael get super SPECIFIC, with thought provoking questions and actionable takeaways in each episode. We also love the witty banter and dialogue between Lauryn and Michael in each episode. What You’ll Hear: A weekly interview series that extends beyond wellness to broader topics like motherhood, mental health, women in the workplace, and perfectionism. What You’ll Hear: Model Ashley Graham interviews high profile women who are a “Pretty Big Deal”. 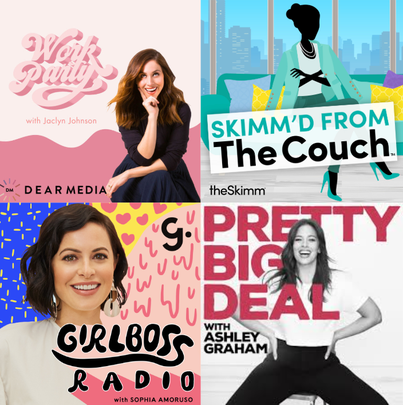 What You’ll Hear: Girlsboss and Nasty Gal founder Sophia Amoruso chats with inspiring women across a range of industries to uncover how they got there and what they learned along the way. Why We Love it: This podcast is raw, lighthearted, and breaks through the mystique of what it’s like at the ‘top’. We also love how Sophia asks about each guest's first job and how early career learnings helped contribute to their success. What You’ll Hear: Hosted by Create & Cultivate founder Jaclyn Johnson, this podcast breaks down the business of being a modern working women. Why We Love It: A combination of inspirational guests and practical advice on how to create the career of your dreams. 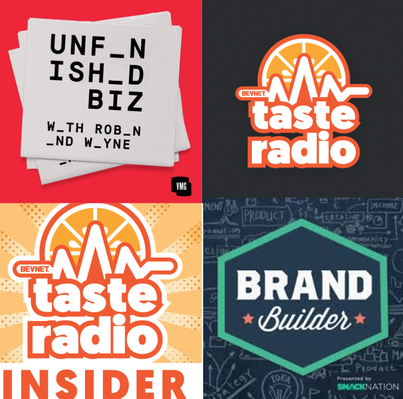 What It Is: From the creators of BevNET and Project Nosh (our go-to site for food industry news), Taste Radio explores beverage, food and beer with the industries’ leaders, innovators and rising stars. Why We Love It: We love hearing from the people behind brands we admire. Plus, it’s reassuring to hear from other founders experiencing many of the same growing pains and challenges as us! What It Is: This weekly interview series from SnackNation highlights both emerging brands and more established veterans with stories and lessons learned from their entrepreneurial journeys. Why We Love It: The episodes are concise and to the point. Plus, we love how each episode highlights three top takeaways that can be applied today. What It Is: This podcast from Wayne Wu and Robin Tsai at VMG Partners sheds light on the highs, lows, and challenges of being a Founder. Why We Love It: Wayne and Robin always ask about the tough stuff, and its fascinating to hear what questions are top of mind for CPG investors like Robin and Wayne. This podcast also adds a human element to brands we love like Perfect Bar, Simple Mills, REBBL, and Dirty Lemon.